Margate Sept. 1. 1769Welcome to England my dear, my honour’d Friend . . . . I met with a very sensible Physician yesterday, who prescribes Abstinence for the Cure of Consumption. He must be clever because he thinks as we do. I would not have you or my Mother surpris’d, if I should run off with this young man; to be sure it would be an imprudent Step at the discreet Age of Thirty but there is no saying what one should do if sollicited by a Man of an insinuating Address and good Person, tho he may be too young for one, and not yet establish’d in his Profession. He engag’d me so deeply in Conversation and I was so much pleas’d with him, that I thought it necessary to give you Warning, tho’ I assure you he has made no Proposal. M StevensonCan’t you send me one little Letter directed for me at Mr. Coleman’s Margate? where I shall be some days longer. 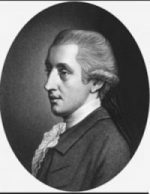 The man Polly describes was William Hewson (surgeon, 1739-1774). He was a teacher of anatomy and noted for his research in the field of hematology. Read more about SUSAN LIVINGSTON SYMMES in the next post which will appear on November 21. Until then I will be visiting family on the West Coast. Bear with a one-time interruption in my posts. Look for another on January 18. Am skipping this blog post because I am attending the wedding of my oldest grandchild. Be back with more on Esther De Berdt Reed on October 15.